In this editon of the parkrun newsletter we congratulate our third and newest member on reaching his 50-parkruns milestone. 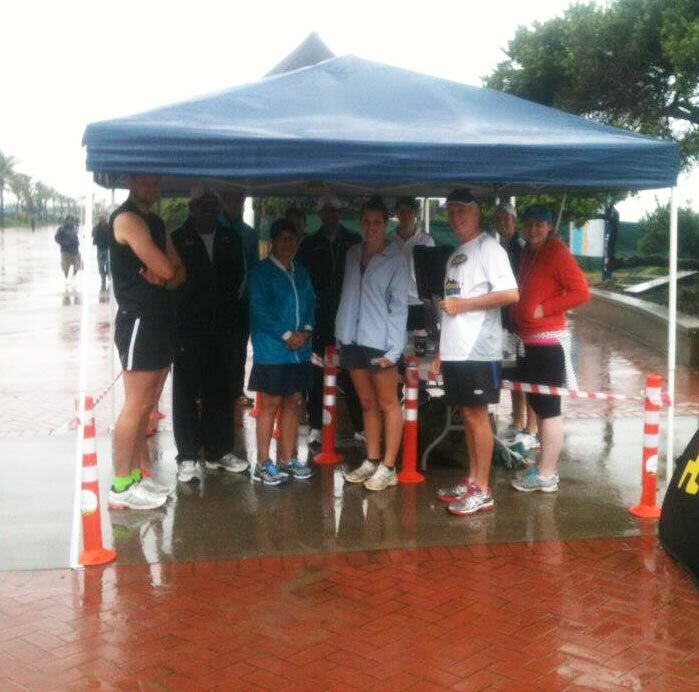 A wet and rainy Durban does not deter runners while Modderfontein parkrun’s second event proves to be very exciting. Roodepoort parkrun hostes a record number of participants and gives us an update on their drive to upgrade and maintain the park facilities. parkrun SA continues to grow apace with the opening of two new parkruns; Sunrise-on-Sea in East London and Modderfontein Reserve in Johannesburg. The combined number of runners from both parkruns was 232, a far cry from the 22 optimistic souls who toed the line at our very first parkrun at Delta Park just over a year ago. The SA parkrun family continues to grow both in events and the overall numbers. There are currently over 6700 registered parkrunners in SA with an average of 100 more joining each week. This unofficially makes us the biggest running “group” in South Africa. However the success of parkruns is not always based on numbers and size. The greatest secret to the success of the parkrun concept is that parkrunners trust us. They trust us to give them accurately measured courses in interesting safe surroundings. They trust us to send them their results as quickly as can reasonably be expected, and they trust us to be there for them at the starting line on parkrun Saturday. So even in the most atrocious weather our volunteers will still be there because we know some of our runners will still want to run. For example, about 6 weeks ago at the Roodepoort parkrun, miserable driving rain resulted in only 6 runners arriving at the start. Nevertheless we went ahead and ran, and I was fortunate enough to be first to finish. When I boasted to Bob Norris ( Nahoon Point parkrun director) that I had won, he taunted me with the words "you beat 6 people!” I relied “No I didn’t, I beat 5 people". This weekend, torrential storms hit Mpumalanga, trapping many visitors to the Kruger National Park in their camps as rivers flooded and bridges were inundated. Just a few kilometres up from the Park, at Summerfields parkrun, conditions were so bad only two hardy souls arrived for the run. Notwithstanding the weather, the parkrun went ahead, emphasising that it is not necessarily size that is important but that keeping our parkrun promise is. We stick to our promises and we will only cancel a parkrun if conditions are dangerous or if another major event has precedence on our course. In that case we will do our best to inform all our runners. This weekend all the current event directors will meet in Johannesburg for a” Bosberaad” (gathering). It is a good idea to know your local event director by name as this is the person responsible for ensuring the parkrun takes place every week. I suggest that you make a point of introducing yourself to your event director and offering to help them when you can. Remember, it is always possible to run and to also be part of the volunteering team. With the new year in full swing many new parkrunners have joined the group at Delta. On the 12th January we welcomed 129 parkrunners. This is the biggest turnout for Delta parkrun yet. The following week there was cause for further celebration when our South African Country manager, Bruce Fordyce, completed his 50th parkrun. Tracy Rankin and Dieter Meyer, who have already run their 50 milestones, escorted Bruce to the finish line. The club 50 Tees arrived from adidas just in time! The celebrations saw Roly Whittaker becoming our oldest parkrunner at 92 years of age. This was his first parkrun and he intends to run more. Later Elaine Greenblatt hosted a breakfast for the Delta parkrunners at her home. We enjoyed a lovely spread and celebrated a wonderful day. It was so exciting to see 3 red club 50 Tees together in the results. Modderfontein Reserve parkrun entered the parkrun world a little after 9 o’ clock on the 12th of January, weighing in with 95 parkrunners eager to see her course. After a little pomp and ceremony from Bruce and Jo-Anne, the parkrun got underway. In usual Fordyce style, Bruce took the lead just after halfway and heading back on the Canal wall he had a clean set of heels, followed by fourteen year old Anrich Zimmermann. Turning back toward Isidleke however, Anrich, who had surely studied the Comrades King’s tactics, gave Bruce a taste of his own medicine, to set a course record of 20:10. Event #2 saw 35 parkrunners, of which 22 were 1st timers, complete the event with wet and muddy conditions underfoot. The hot and humid conditions did little to dampen spirits, with a herd of us meeting up afterwards at the Dynamite Coffee Company, for a post-parkrun brekkies. 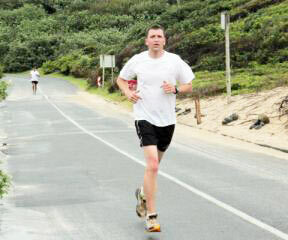 The Durban coast has been slammed by torrential rains over the last two parkrun Saturdays. Surprisingly, this has not been a deterrent to our runners and we have been so impressed by everyone’s attitude to get out and active, even when the weather has not been ideal. As with all parkruns, the event will take place every Saturday, come rain or shine, and we hope you will be there too. North Beach parkrun would like to challenge all Duzi and Comrades marathon participants to include parkrun in their training schedules. It is a great way to see if you are getting fitter and faster before your events. The measurements are accurate and the atmosphere festive. Bring your families and friends along for a good time! We are also pleased to announce that our parkrun is the only one in South Africa, so far, whose course is wheel chair friendly! If you have any friends or family who are willing and able to participate, then encourage them to come along..
We were very fortunate to have Claus Wagner from Kingston, UK attend our parkrun event #12. Claus made his 100th parkrun appearance at North Beach parkrun! He now gets to wear the much sought after black Club 100 parkrun shirt. Well done Claus, we hope to see you again soon! There has been a lot of activity in Roodepoort over the last two weeks including a record field of over 100 runners! Lets see if we can improve on this number once again this coming Saturday. Mncedisi Zulu was awarded his Club 10 T-shirt at our record event. He is one of a handful of juniors to have achieved 10 parkruns. Well done to all of you! Left: Mncedisi Zulu receiving his Club 10 T-shirt from David. Over the years many residents in and around the Florida Park area have chosen not to venture into the parks due to crime and the degradation of the park facilities arising from lack of government funding. Fortunately for Roodepoort parkrun, a few of our members have come together in order to revive the Len Rutter Park and we hope to restore it to a safe and well-maintained facility. The first priority on our list was the cutting of the grass. This has been done irregularly in the past, but we are positive that this will take place more frequently, after opening channels of communication with City Parks. parkrunner George Taylor spent two hours walking the parkrun route yesterday, followed by the tractor, to make sure that the path was trimmed in time for this weekend’s event. Thank you George for your efforts! We are all grateful for your contribution. New signage will be erected at the entrances of the park to prohibit dumping and littering and a number of new dustbins will be installed.. Vagrants are also being vacated from areas in the park with the help of the SAP. We will keep you up to date as further progress is made. We would like to appeal to any of our parkrunners who can assist with donations or sponsorships of building materials, including ablution facilities and security gates for the restoration of the lapa. For a list of what we require, please contact Roodepoort parkrun. Another exciting announcement to our parkrunners - Dunmar Security has joined forces with Roodepoort parkrun and will attend every Saturday to look after the parked vehicles so that you may feel at ease as you enjoy your 5km run and walk. It is especially nice to know that our volunteers are safe when they arrive early to set up before the event. A big thank-you to Dunmar Security! What do you do at parkruns: Setup, markers and packing up. How has parkrun changed your running: I have always been an avid runner, but doing parkrun re-awakened my love for cross-country running. What do you like about parkrun: I like doing parkrun for the social aspect but as with any event there is a competitiveness between runners for best times and most parkruns completed. I also like inviting my friends to join me at parkruns as it is a short distance together with an 8a.m. start (to let them sleep in after a Friday night out). 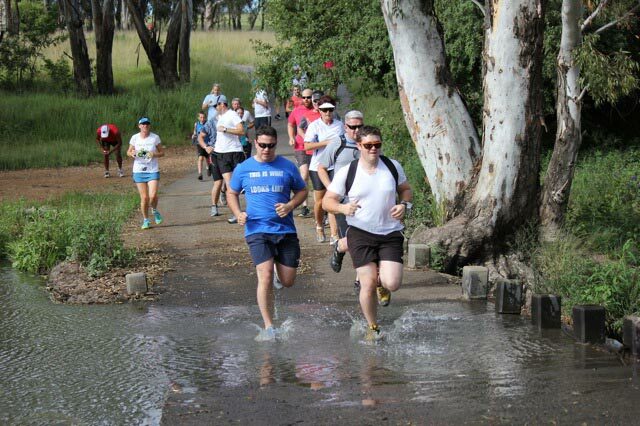 Most memorable or funniest parkrun moment: We did an April Fools parkrun, running the course backwards. I crossed the line first on that particular day! In this edition of the parkrun newsletter - Festive Season celebrations all round, at South African parkruns with numbers remaining consistent. The largest turnout at the launch of the second parkrun in East London. Roodepoort parkrun appeals to the parkrun community for support to complete a survey for the upliftment of their lapa facilities. 2012 has been a great year for parkrun South Africa. Our parkrun family has grown from one event (Delta) to six established events. In addition, we now have over 5600 registered runners, quite a leap from the 88 parkrunners who had joined us at the end of 2011. 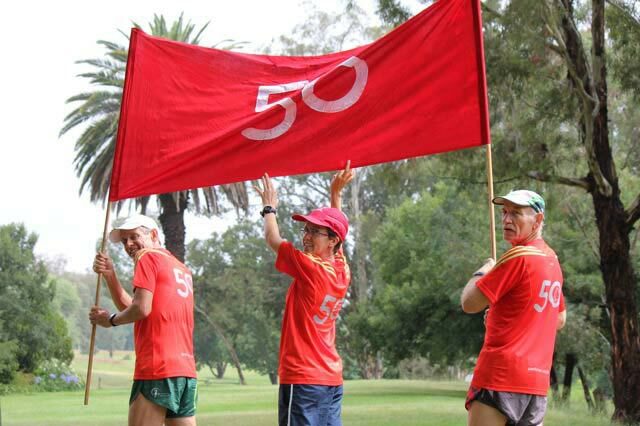 Tracy Rankin and Delta Dieter Meyer became the very first South African parkrunners to earn their red club 50 T-shirts. We are now also regularly visited by overseas parkrunners. This growth would not have been possible without the invaluable support of our sponsors. Blue Label Telecoms helped us get started and in 2012 adidas joined the family. Each of our parkruns has its own unique character under strong leadership with great teams of volunteers. We would like to encourage parkrunners to also visit other parkruns. We urge you all to volunteer at your home parkrun at least three times this year. Volunteering insures the success of every parkrun. (more on this below). 2013 promises to be even more exciting than 2012. As I write this, I am en route to East London for the launch of the Sunrise-on-Sea parkrun. Next Saturday it will be the turn of Modderfontein parkrun to have its inaugural run. There are teams investigating possibilities of starting parkruns in Cape Town, Stellenbosch, Paarl , Centurion and Port Elizabeth. I have also received some enquiries from neighbouring African countries. Happily more sponsors have approached us so we should have the backing to make 2013 a very successful year for parkrun South Africa. This beautiful route is kindly presented to parkrun by Heartlands and the Endangered Wildlife Trust as this parkrun event is set to take place within the Modderfontein Nature Reserve. PLEASE NOTE: NO dogs are allowed in the Modderfontein Nature Reserve and parkrun barcodes are essential to gain FREE access into the Reserve. The course starts on the tar road, 500m down from Isidleke, and follows the road before turning left onto roughly strewn tar road. The meandering route continues over a causeway onto an undulating gravel road and around the far side of the dam. Turning left at the waterfall , aptly named the Vic Falls, you proceed to climb onto the dam wall and run on the grassy path with a view of the dam, reeds and bird life. At the end of the dam wall, runners will turn right and go over the bridge to the tar road and return to the finish at Isidleke. Happy New Year to all parkrunners! May this year bring you health and fitness together with more memorable parkrun moments. The Festive Season is typically filled with celebration and in many cases, overindulging when it comes to good food. Lucky for us, however, there is an opportunity to start the year off with a few new year’s resolutions. If you have not thought about your resolutions, then perhaps you would like to volunteer at parkrun. Our Christmas theme at Roodepoort parkrun was a huge success. Well done to Christo Meyer who was awarded a prize, courtesy of Randburg Runner, for being the best dressed. He arrived for his first ever parkrun dressed head-to-toe as Santa and even ran with a sack draped over his shoulder for the entire 5km! Once again, we would like to thank our parkrun members for contributing to our non-perishable food collection for the underprivileged in our surrounding community. The food was donated to St. John the Apostles Catholic Church in Florida for distribution. As our racing season starts and we begin the countdown to Comrades and Two Oceans, we look forward to seeing big turnouts at our parkrun, including new runners and walkers! Thank you to everyone for your support throughout the year we wish you many fun and sunny parkruns for the year ahead! We are fortunate to have such a beautiful park (Len Rutter Park) in which to host our Roodepoort parkrun. Unfortunately, over the years, there has been neglect on the part of the Council (City Parks) with regards to the upkeep of the lapa and general maintenance such as toilet facilities, grass cutting, the three bridges over the river and the litter. The City Parks website does not even list Len Rutter Park. We are embarking on a campaign to get our lapa and ablution facilities up to scratch for everyone to make use of. Please click on this link to complete the short survey. This will let City Parks know that it is a priority. The more parkrunners that participate, the better. Please also take a moment visit the Facebook page to see the condition and health hazard that the facilities pose. Thank you for your support on this matter. We will all benefit from the lapa and ablution facilities in the park once they have been restored to their former glory. More on this to follow. Despite a mudslide, and a forced 200m detour of our usual parkrun route, Summerfields parkrun was met with a great turnout from visitors to the Lowveld over the Christmas pariod. Great news for aspiring Lowveld Comrades runners - Comrades legend and parkrun South Africa Manager, Bruce Fordyce, will host the Summerfields parkrun on 2 February 2013, and give a talk afterwards on training, preparations, nutrition, and race strategy at the Summerfields Deli. Diarise it now - invaluable free information from the Comrades King himself, and an opportunity to ask your most burning Comrades questions. Remember to register and bring your barcode to every parkrun and may you achieve all your running goals in 2013. Delta parkrun’s numbers dropped slightly in December but that was because many of our parkrunners were away on holiday. 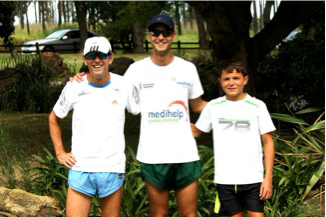 It was exciting to see our parkrunners names cropping up at other parkruns in South Africa. It was also gratifying to see new runners continuing to register. There are now over 1600 registered runners at Delta most of whom have contributed to the international parkrun milestone of 2 million runs. Tracy Rankin and Dieter Meyer both earned their red 50 T-shirts becoming the first South Africans to reach this significant milestone. We were also visited by really talented Ethiopians who threatened the course records and showed us what fast running can achieve. Christmas was celebrated with a fancy dress run on the closest Saturday. The launch of East London’s much anticipated second parkrun at Sunrise-on-Sea was extremely successful and surpassed even the most optimistic of locals when 137 parkrunners lined up at the start, excited to explore the new route. This became the largest inaugural event launch in South Africa to date and far surpassed its big brother, down at Nahoon Point, who launched with 81 in August this past year. Danie Bessinger and his extremely eager team of volunteers will be the first to acknowledge that as with any other event Sunrise-on-Sea is a work in progress, but all went off without a hitch and I do believe that Bruce and Gill Fordyce will have gone back to Johannesburg after the event very pleased with what they witnessed and participated in. This new parkrun offered everything that regular parkrunners have come to expect – including tranquil deviations over the beach and through scenic farmlands. Local radio station, Wild Coast FM 98.6 offered their support through coverage in the build up, during and after the event launch at Sunrise-on-Sea. It is going to be wonderful to watch this new event blossom over time into another spectacular parkrun. What a fantastic Festive Season we have had. The weather has generally been excellent and visitors have been fairly prolific in their support of our parkrun despite it being holiday time. Our Christmas run went down very well with many strange creatures along with Santa impersonations on the day. Amongst the visitors we were pleased to welcome were Ingrid Wagner and David Venter from the UK and their home parkrun, Kingston parkrun. They were both approaching their 130th parkruns at the time and by now would have achieved that. On their first visit they wore their red shirts, which stirred some interest among the local runners. On the second occasion it was the black shirt that was worn. Our visitors said a few words of encouragement to the group at the start. They concurred that Nahoon point is the most difficult parkrun they have ever run, but also one of the most scenic of all. We can’t have it all now can we? After 22 runs we now have six juniors reaching Club-10 status and we congratulate Henke Ackermann, Taryn Hensberg, Ryno Owen, Keanu Britnell, Hannah-Rose Percival and Azzara Makan on their achievement. You are all inspiring young people. With the launch at the weekend of the Sunrise-on-Sea parkrun up the East Coast we were interested to see what impact it would have on Nahoon’s numbers. I was at the new launch and recognised some of the Nahoon Pointers at the start line and assumed there would be a measurable drop. To my surprise, 274 runners finished the 5km at Nahoon. To all parkrunners in South Africa, we in East London, wish you a fantastic 2013! Hot, hot, hot…that is all we can say about Durban…however all the great weather makes it easy to get up for a Saturday morning parkrun. Our Christmas event was well supported by many of our parkrunners dressing up and making unconventional choices with regards to their running attire. We were very fortunate to have many visitors to North Beach parkrun over the festive season with parkrunners from the UK, Johannesburg, East London and also very excited “parkrunners to be” from Cape Town. With 10 events under the belt and finally moving our start point back to the grass area in front of Suncoast Casino we expect only great things for 2013. We hope to see you at the next run. "What an awesome morning. My sister Angela Bax, Willie and I did our 1st parkrun at North Beach. Friendly, fun but oh we were so slow!! Come and join me every Saturday morning. The parkrun team is so well organised, I am going to make this part of my routine..."
What do you do at parkruns: Setup, markers, tunnel setup and admin. 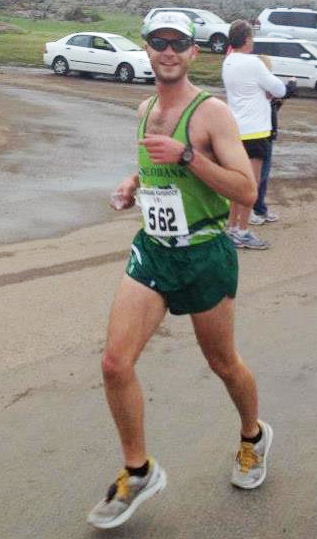 How has parkrun changed your running: I have never enjoyed running, but in almost 20 weeks, I have become a very keen trail runner..
What do you like about parkrun: parkrun has provided the ideal platform and, as a result, has grown my interest in running and to a greater extent has improved my overall health and fitness levels. parkrun ensures that I focus on my training runs during the week in order to maintain or improve my times and aim for a PB on Saturdays. We have an amazing course and it is indeed a privilege to be part of Nahoon Point parkrun. I enjoy the challenge and the weekly friendly faces of the runners and volunteers. Most memorable or funniest parkrun moment: The Christmas run 2012 – many strange outfits, great atmosphere and the course was run in reverse – a great attendance too!